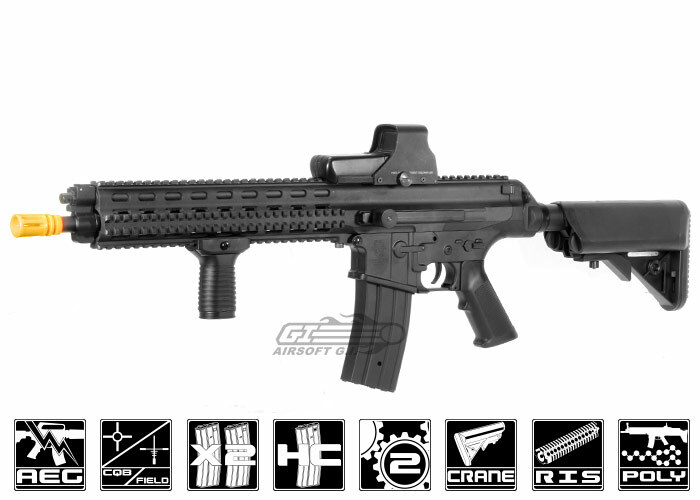 The ECHO 1 Robinson Armament Polymer XCR-L AEG Airsoft Gun is the latest gun to hit Echo 1's line up of extremely high quality and realistic airsoft guns. It's full metal counterpart was first unveiled at SHOT show 2011. The Echo 1 XCR is based upon the real steel rifle of the same name by Robinson Armament Co. The real steel XCR is unlike most current rifles due to what they call the "Kalashnikov Theory". The XCR operating system uses a super reliable piston driven, heavy-duty, three-lug bolt which incorporates a heavy duty extractor and a fixed ejector. The XCR is modeled with AR-15 ergonomics in mind which means transitioning from your M4 style rifle to the XCR will be nearly seamless. 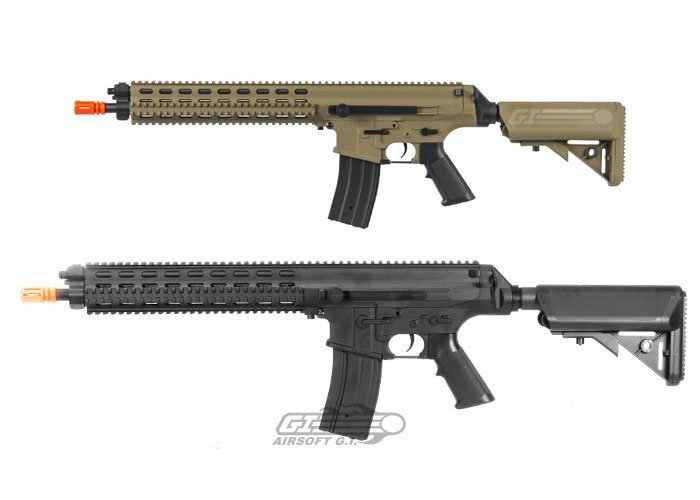 Even though the XCR looks very similar to the AR-15, at first glance, they are two completely different beasts. The Echo 1 polymer XCR features an adjustable crane stock that is perfect for not only housing the battery, but adjusting the overall length of the gun to fit the user as well. This is great for setting the perfect position for shooting. The lower receiver of the gun features fully licensed engraved trade marks that make the Echo 1 XCR look great. The upper of the Echo 1 XCR resembles that of the SCAR and is one complete piece of high quality polymer that allows for no movement of the rail system. The Echo 1 XCR features a completely monolithic top optic rail for mounting any combination of optics. The Echo 1 XCR features an integrated rail system for mounting anything from vertical grips to lights. The internals of this gun are spectacular; the XCR features a unique gearbox that is compatible with most V2 parts. The XCR features a high quality polycarb piston with the second to last tooth removed for improved gear engagement. The cylinder, cylinder head, aluminum ported piston head, bearing spring guide, high speed gears, medium length motor, hop up bucking and inner barrel are all high quality version 2 parts. The Echo 1 XCR also features many parts that are unique to the gun including the wiring harness, air seal and a split style gear box. 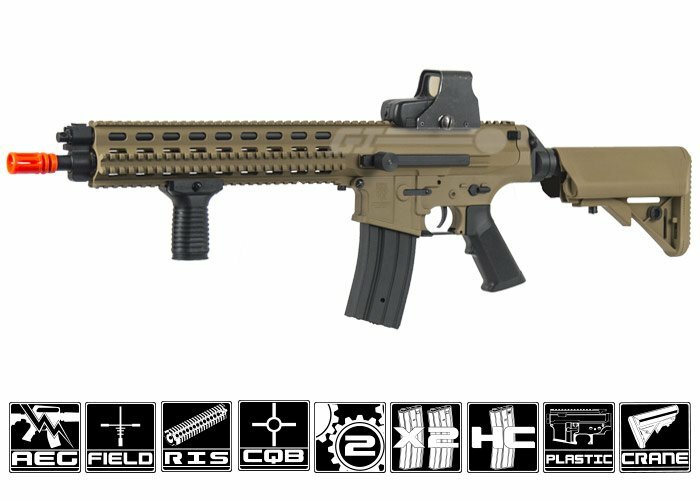 The Echo 1 Robinson Armament Polymer XCR-L AEG Airsoft Gun is definitely going to impress any player that is able to get their hands on it. Product does not include a Red Dot Sight. This is my first aeg and all i can say is great wight to this gun shot straight right out of box can't wait to use on my first out go. Yes i am a newbie to Airsoft so for my first gun will be hard to compare to anything else. Hands down my favorite stock airsoft AEG I've ever used this thing is pretty accurate right out of the box would suggest to upgrade to a tight bore and a flat hop or r hop but not needed right away I've been airsofting for years and never liked echo 1 anything everything I have ever gotten from them had usually arrived broken or some form of defect but this gun has restored my faith in the company to make more great products just like it. I didn't pay for the gun I got it for free in the give away form airsoft gi but let me tell you echo 1 could charge $300 for this thing and itd be worth every penny in my opinion still. If I had to give this a con would be there always out of stock cause there so good! Whatâ€™s a good look for this gun? A 9.6v 1600mah NiMH or 7.4v 1000Mah lipo would be ideal.